Yep, it's that time of year again. Check in over the next couple of weeks for some cool gift giving ideas...and a chance to win the spotlighted goodies. While most of the items we feature during the 12 Days are already available for sale, these two aren’t yet... but don’t let their unobtanium status scare you off. You’ll find them on their site eventually. In the meantime, don’t forget to leave a comment below so you have a chance to win them. The Motorex Racing Paddock Mat measures in at 100 x 220 cm and has an extremely absorbent surface that can soak up to up to 7L/m2 of oil, water or other liquids. It’s FIM-homologated, so it can be used at international racing events...or your garage. Anti-slip & fire-resistant, it also makes it easy to spot bolts that you might drop, and it’s machine-washable at up to 30°C. 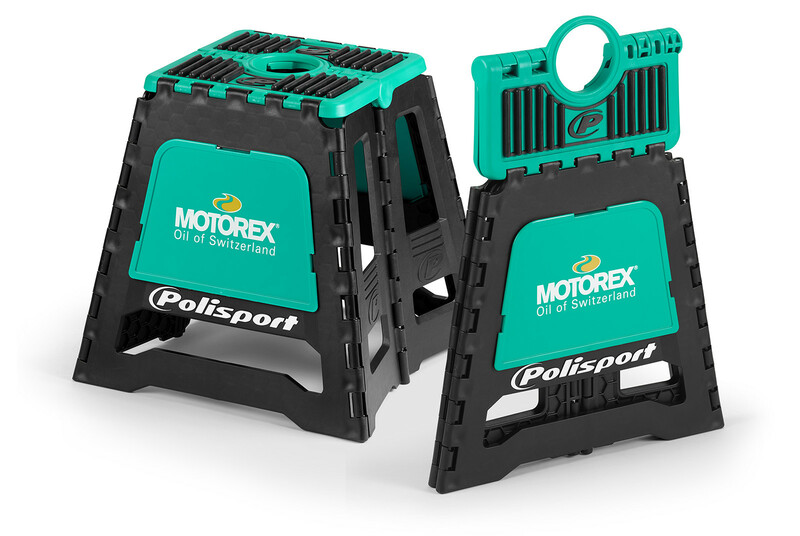 The Motorex Folding Bike Stand is produced by Polisport, and features the Motorex green color on the top and side inserts. This one features high quality injection-molded polypropylene construction with an injection-molded rubber top that folds for easy storage. It’s lightweight, yet is extremely durable and can hold up to 550 lbs. That would finish off my garage perfectly! Look good with the Factory Edition on top! I would love to have this! They say these stands are the best! does this work with yamaha bikes? haha! Nice for saving space in the truck. Hell yeah, perfect for the 501!